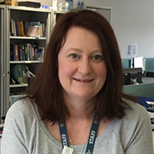 Rachel Picton joined London South Bank University in Autumn 2017 following her time at Barts Health NHS Trust where she was the Associate Director of Education for the Allied Health Professions. Prior to this, Rachel worked extensively in clinical and leadership roles across the health sector. Rachel trained as a diagnostic radiographer at Addenbrooke’s Hospital, Cambridge, qualifying in 1989. She is a member of the Society and College of Radiographers and an HCPC Registrant. She also works as a specialist advisor for the Care Quality Commission and as an education visitor for the HCPC. Her interests include workforce development, leadership and change management. Rachel’s pre-registration diagnostic radiography teaching includes: contemporary debates, change management and leadership. Rachel has experience working with health services in the UK and Singapore, promoting and supporting the development of joint projects to evaluate service provision and development of new courses.